This interview was previously published in Sculpture, 27(6), pp. 42-7. Artists, like other professionals, sometimes hit key turning points in the development of their work. Such is the case right now for Mischa Kuball, who has built an impressive practice by “generating a certain awareness about streams of interaction in terms of a psychological dimension in urban space and structure.” Working with visual properties of light and manipulations of space, Kuball creates works that, beneath their coolness and academically oriented phrasing, are driven by the heart. His recent projects reveal a need to promote social and political change via “the powerful emotion of light,” best exemplified by the emotion-packed Refraction House (1994). Within this framing, Mischa Kuball’s works span a continuum of emotion, with subjects ranging from hot social-political topics to cooler, restrained political commentaries, to those that are more formally driven. Plus, he’s now bringing brain scans into his art portfolio. No matter the emotional temperature of Kuball’s works, they all engage in a clear investigation of form. Mischa Kuball art: Refraction house, (1994). Spotlights and scaffolding, each scaffold 5 x 3 m. Installation at Projekt Synagoge Stommeln, Germany. R. J. Preece: In an earlier interview, you identified Refraction House (1994) as your favorite work. Why this project? Mischa Kuball: Refraction House was a breakthrough work for me. What you see is a synagogue that had been out of service from 1937 until 1991, when it was converted into the Projekt Synagoge Stommeln, an art space that invites and commissions artists to propose projects and installations in the interior. 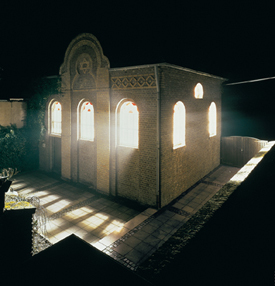 Instead of placing something inside the building, I proposed to use light to magnify the presence of the former synagogue, which partly connected to my ongoing work featuring the element of light at night. So, with Refraction House, the former synagogue could be seen from a distance, glowing, projecting a strong presence with its symbolism. R. J. Preece: There is still concern about the neo-Nazi element in Germany, and there are reports about neo-Nazi activity. I was recently speaking to Berliners who said that certain areas outside the city center are no-go areas for them as foreigners. This extremism is in direct contrast to the attitude of most Germans. Mischa Kuball: Yes, our country’s history makes most of us entirely aware of the threat and its signs, perhaps more so than in other places, where people have not fully experienced the threats from within their own societies. R. J. Preece: Some artists, while feeling compelled to do this sort of work, would have opted out. Even some writers would steer clear of it. What sorts of risks/fears did you and the organizers have? Mischa Kuball: The organizers behind the two-month-long project, Angelika Schallenberg and Gerhard Dornseifer, did indeed take a great risk. It was a greater risk for them as selectors than for me as an artist. But this site is also near Cologne, a very liberal city and a city of the arts. I invited the people living near the site to get acquainted with the idea and the possible “side effects,” such as the strong possibility of violent attacks by neo-Nazis at night, when the synagogue was highly visible. I was pleased that the people of Stommeln created what I’d call “an energetic ring of solidarity” around the work, which was stronger than any kind of aggression. R. J. Preece: Did anything negative happen during the installation? Mischa Kuball: We were shocked when we learned that the old synagogue in Essen, 50 kilometers from Stommeln, had been attacked with stones and left with smashed windows. But this was not connected to our specific installation. Stommeln was left in peace at all times— arts and general media coverage (TV, radio, and print) supported the neighborhood’s protection of the site. R. J. Preece: Compared to your other work, your Bauhaus installation (1992) is more of a precedent for Refraction House, but in this context, you were working with a less controversial site, the Modernist aesthetic temple, located in the former East Germany. Mischa Kuball: Yes, I did that project in 1992, three years after reunification. It aimed to revitalize the energies there, with reference to the importance of the Bauhaus school. In essence, I wanted to symbolize its new possibilities, bringing it back into the world after a long, dark period. It was a kind of mission. There was no budget, no people behind it, but I felt that I had to do it. I used light, projecting symbols taken from Josef Albers’s classic Bauhaus course. With this installation, I essentially intended to re-initiate communication of the ideas within the building that had been stopped after the Nazi takeover in 1933. It wasn’t until 1978 that the Bauhaus restarted its activities, but this was within a Communist context. The projections placed the ideas outside the building, into its context, beginning to communicate again with the community. Mischa Kuball art: Public square, (2007). View of performance in Hamburg. 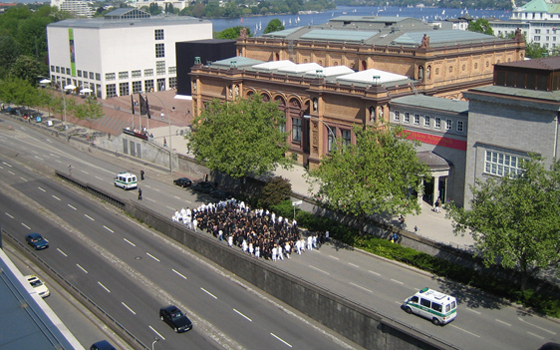 R. J. Preece: Public Square, your project-performance in Hamburg (2007), refers to Black Square (1913–15) by Kazimir Malevich. This work complemented a thematic group exhibition, “Black Square,” inside the Kunsthalle, which paid homage to and raised questions about the classic work and the artist’s approach to public space. Could you explain the concept? Mischa Kuball: I decided on Public Square as a way to make a statement and complement the show. The idea was to use the structure of Malevich’s work but re-present it as a parade-like performance-painting with more than 500 participants. The structure of the “painting” was constantly changing in the performance and— with its placement in relatively capitalistic Germany— the square changed into a rectangle, and so on. The performance aimed to show the amorphousness of a tolerant society. Public Square commented on and critiqued Suprematism (Malevich and others) and its desire to conquer urban space and daily life, or at least impose an order, which didn’t really work in the long run. R. J. Preece: So you paralleled “light” with white from Malevich’s work. Black-and-whiteclad participants moved through the city to make a slow-motion, metamorphisizing “action painting.” What did you learn that might contribute to your future politically-oriented projects? Mischa Kuball: I learned that I need to invest more time initially into effectively communicating my objectives to those inside and outside the art world. Sometimes you develop ideas that become complex, and then you have to try to simplify them to bring more people in. For example, we needed a police permit to do the performance, but the first response I received was, “A political demonstration!” This was not, to say at the least, the reaction I was aiming for, but it shows the complexity of public interaction. R. J. Preece: You’re approached by museums around the world for funded projects, but you are doing art interventions in the Balkans, often without much funding. Why? Mischa Kuball: The Balkans are still emerging, after a time of isolation and devastation, and I’m driven to do work there. First, in 1999, I was invited by Heike Munder, director of the Migrosmuseum in Zurich, and Zoran Eric, curator of the Museum of Contemporary Art in Belgrade, to do research in Belgrade. This resulted in a public project with a small performative intervention, but basically it was an opportunity to get acquainted with the region. Later I accepted an invitation to run a workshop in Banja Luka, Bosnia-Herzegovina, initiated by a local art group called Protok. I collaborated again with Zoran Eric, but also with Dunja Blasevic, from Artspace in Sarajevo. Parallel to this activity, we established a cooperative with the Tirana Art Academy in Albania, which is in a very difficult state vis-à-vis Europe since Albanians need a visa to come to the EU and Germany and it is hard to get approval. In the end, we invited four young students from Tirana to study for six months in Karlsruhe at HFG/ZKM. We also did a project together at the National Gallery of Tirana, which lasted until October 2007. We’re trying to raise awareness of public art there because it’s a way to show the region’s current state of mind to art people and the general public. R. J. Preece: I understand that you are also doing neurological research right now. You have been having scans made of your brain activity, which you’ve exhibited in the form of multiple projections at the ZKM, the Center for Art and Media Technology, in Karlsruhe, Germany, where you used to be a professor of educational programming. Do you see yourself as working within the context of the bio-art movement? Mischa Kuball. Broca Re:mix, (2007). 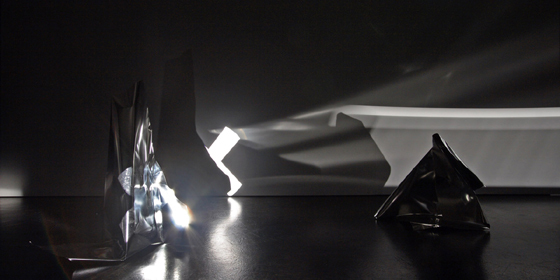 Stainless steel and projections based on brain scans from Magnet Resonance Tomography, installation view. Mischa Kuball: Yes, that’s another developing strand in my practice. I’m working with neuroscientists from three different institutions— RadPrax Düsseldorf, the Ruhr University of Bochum, and the Neurosurgery Centre in Krefeld. The results will come into consideration for the next steps toward an advanced visualization of brain activities in Broca’s area, believed to be the center of language thinking and mechanics. Seven years ago, I started experimenting with taking brain scans, and I developed my first ideas for an installation, Broca’sche Areal, at the ZKM collection, which as many know is one of the leading institutes for the study and exhibition of art and science. My next area of inquiry resulted in Broca Re:mix (2007), which I exhibited in a solo project at ZKM using projections and metal structures. These referred to the results of the brain scans and exemplify my continued investigations into this area of art. This is a fairly new form of exploration: the possibilities can go in a number of exciting directions, I think. R. J. Preece: The bulk of your work, however, is not bio-art, it is more formal and not so obviously political and emotion packed. 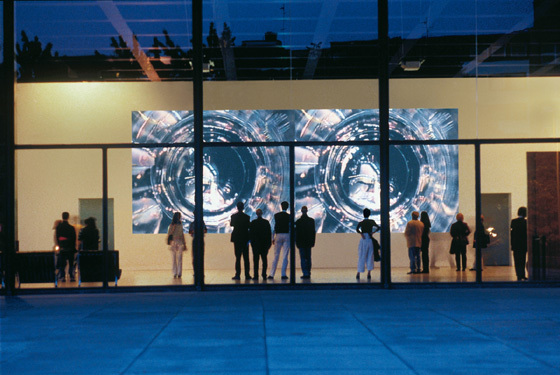 Mischa Kuball art: Stadt durch Glas / Night version NY, (1999). View of installation at the Nationalgalerie, Berlin. Mischa Kuball: Yes, the works that are more formal, as you say, are ones like City through Glass (2003) at K20 in Düsseldorf. They aim to generate emotion, but as a response based on aesthetics and daily life as opposed to something “emotional/political.” At K20, viewers see a video installation of side-by-side shots focusing on the inside of an unusual drinking glass. The site is a busy pedestrian passageway, which connects the Düsseldorf city center on one side and a residential/commercial area on the other. The entrance to K20 is to the right of the artwork. The project aims to present “the familiar” in a new context and maximize the number of viewers “in a museum context” by placing the installation in a more publicly used site. I have made a series of city-related works that closely study drinking glasses in this sort of way. This started in Düsseldorf in 1995 and continued on to New York, Tokyo, Brisbane, Essen, and Moscow. Mischa Kuball art: Megazeichen, (1990). 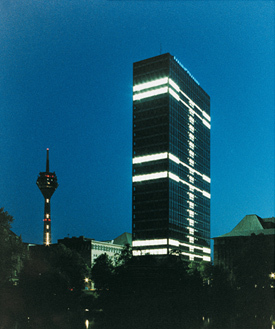 Light, view of interactive work at Mannesmann Building, Düsseldorf. R. J. Preece: And what about Megasign (I–VI)? Mischa Kuball: I would describe this work as “political” because the site is an office building. After the employees left at night, it was transformed into a large-scale light sculpture. There are photos on my Web site that show the different combinations of light projected out from the floors of the building. Over a two-year period, I discussed the work with about 700 office workers since they needed to switch the lights on or off in their offices. They agreed to a different plan each week, and many really liked the idea of transforming their work site into a public artwork. From start to finish, there were six Megasign public artworks over a six-week period. Mischa Kuball art: space - speech - speed, (1998 / 2001). 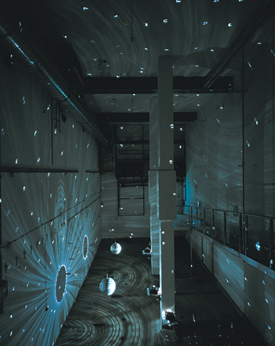 Mirrored balls, projectors, motors, slides, installation view. R. J. Preece: Clearly, in this case, the political is not as emotional as in Refraction House and the Bauhaus intervention. What about space-speech-speed (1998/2001)? Mischa Kuball: That’s an example of one of my interior, more formally driven works. The starting point is a sphere covered in numerous tiny, convex mirrors. Three projectors sent light through three slides to project the words “space,” “speech,” and “speed” against the convex surface of three mirror, or disco, balls. Due to the size of the tiny mirrors, each one more or less captured one individual letter of each word. The “deconstructed” projections reflected against the mirrors and were then projected back against the walls. This created a swirling effect of letters, language, light, space, and the feeling of floating in an atmosphere. The “more formal” works, as you call them, also feed into my other works, but they stand up on their own, in their own contexts. These were works that I wanted to pursue at specific times, with specific people, in specific contexts. R. J. Preece: So, your practice seems to have three main pursuits going on. Each one feeds the others in foundational ways, providing new angles and insights. Each area provides fuel to take whatever you choose further— at this time, your political works. And the task is to work with people who can appreciate these sorts of diversified, multi-disciplinary practices. Mischa Kuball: Absolutely. One hopes people see it that way. With regard to the political projects, the more formal works are definitely important formal reference points. They’re also filled with knowledge and experience based on all of the negotiations, processes, and problem-solving built into them. I’m still interested in pursuing the more formal works, the less political and emotional ones. And when I go back to them, the insights from the political works will help strengthen their impact. This accumulated knowledge, one hopes, makes me a better artist— across “bio-,” “formal,” and “political” spheres that aim to instigate emotions and thinking. The goal is to become an artist who can effectively work with people and decision-makers in different contexts to make stronger statements. You always have to strive to communicate more effectively, with more impact. You always have to try to make even better artworks, especially now. There’s too much at stake, isn’t there? R. J. Preece closely assisted Kuball in refining his presentation to express more precisely what he wanted to communicate, within the format of this feature interview.